In the application of inductive logic to a given knowledge situation, the total evidence available must be used as a basis for determining the degree of confirmation. In Logical Foundations of Probability (1950, 1962), 211. 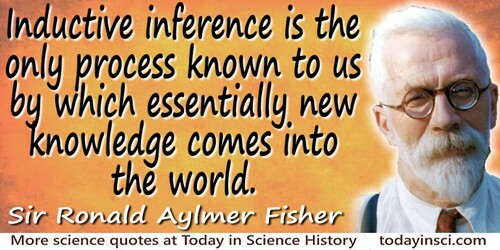 Inductive inference is the only process known to us by which essentially new knowledge comes into the world. In The Design of Experiments (1935, 1971), 7. There may be instances of mere accidental discovery; but, setting these aside, the great advances made in the inductive sciences are, for the most part, preceded by a more or less probable hypothesis. The imagination, having some small light to guide it, goes first. Further observation, experiment, and reason follow. Presidential Address to Anniversary meeting of the Royal Society (30 Nov 1859), Proceedings of the Royal Society of London (1860), 10, 166.